Choose 5K or 2K on Step 2. You can register 2 - 10 people in a single transaction with one transaction fee. 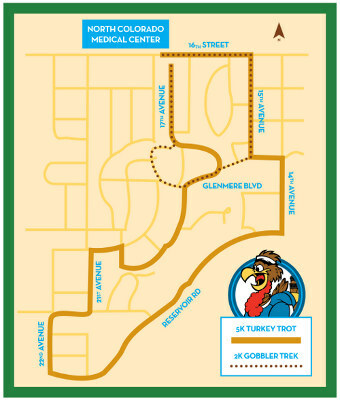 The NCMC Foundation, along with the CardioVascular Institute of North Colorado at NCMC will host the 22nd Annual NCMC Turkey Trot on Thanksgiving Day, November 28, 2019. Now in its 22nd year, the NCMC Turkey Trot has become apart of many Northern Colorado residents’ Thanksgiving tradition. Proceeds from the NCMC Turkey Trot benefit the Cardiac and Pulmonary Rehabilitation program at North Colorado Medical Center. Open to participants of all ages and abilities, the NCMC Turkey Trot is the perfect way to spend time with friends and family, promote cardiovascular and pulmonary health awareness, support local patients and work off those pre-holiday treats! For the safety of race participants, DOGS ARE NOT ALLOWED at the Turkey Trot. Thank you. PARKING: Park in the east parking lot off 16th Street; use east entrances 5 or 6 and follow signs walk-in registration. Register online early to ensure your t-shirt size! Park in the east parking lot off 16th Street; use east entrances 5 or 6 and follow signs to packet pickup. The 5K will start at 9:00 am and the 2K will start at 9:15 am. We ask that walkers start the race behind the runners. Thank you! 12 & under, 13-15, 16-19, 20-29, 30-39, 40-49, 50-59, 60-69, 70 and up. Age group winners will receive fresh pies donated by local bakeries. Please be present to accept your award. Unclaimed food awards will be given away as door prizes or donated to area agencies. Attention - 5K winners will be determined on the basis of Gun Time. For those participants who prefer a shorter course, the 2K Gobbler Trek is a great alternative! Medals will be awarded to the top three 2K participants in each of the following age categories based on Gun Time: 6 and under, 7-9, 10-13, 14-19, 20-40, 41-60, 61-70, 71 and up. Attention - 2K winners will be determined on the basis of Gun Time. No competitive runners please! *All kids 12 and under will receive finisher ribbons for both the 5K and 2K. Gun Time: A winner of a race is determined by who crosses the finish line first, thus overall and age category results are based on Gun Time. Gun Time is based on the time when the gun goes off (READY SET GO!) to the time the participant crosses the finish line. Every participant who starts in the same wave is assigned the same Gun Time. When this page loaded, the official time was 4:13:38 AM EDT.